Ordinance No. 10, Series of 2014 - Ordinance Regulating tattoo and body Piercing Facilities. Ordinance No. 17, Series of 2013 - Ordinance Establishing CHT Operations. Ordinance No. 2, Series 1999 - Requiring public and private hospitals and clinics to set up Measures to Prevent the Transmission. Ordinance No.5, Series of 2003 - Quarantined for Suspected SARA. Ordinance No.17,Series of 2002- Vigan City Code on the Maintenance of Cleanliness and Sanitation in public places. Ordinance No.28,Series of 2005 Bird Flu Ordinance. 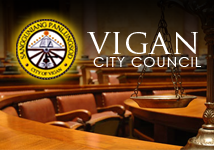 Ordinance No 3,Series 2000- Prohibing non-Residents of Vigan from Dumping Garbage within Vigan. Ordinance No 7,S.1998-Establishing the Blood Donors Program in Every Barangay. Ordinance No 7,Series 1996 - Prohibiting urinating, defalcating and or littering in Public Buildings, Streets, Plazas in Vigan. Ordinance NO.15, Series of 2002- Requiring all Government and private establishment or agencies,schools for a trained First Aide. Ordinance No. 24, Series of 2015-Ordinance establishing fees for gram testing in the CHO.